Tilt to Live fans rejoice! One Man Left has just announced that their Sophomore title, Outwitters will finally be making its App Store debut this Thursday, July 5th. I’ve had a chance to play some of the early builds of Outwitters, and boy are you in for a treat! The game is a smart, tile-based multiplayer strategy game with loads of very cute exterior polish, backed by rich, satisfying strategical game play. It will be a free-to-play Universal app allowing for 1-on-1 or 2-on-2 asynchronous multiplayer matchups via your Game Center account or local pass n’ play. Players start off matches by selecting one of a number of teams, each with its own specialty unit. The base team is The Scallywags are pirate fish, whose special character is a hermit crab that transforms into a mortar cannon. They come for free with the app download. 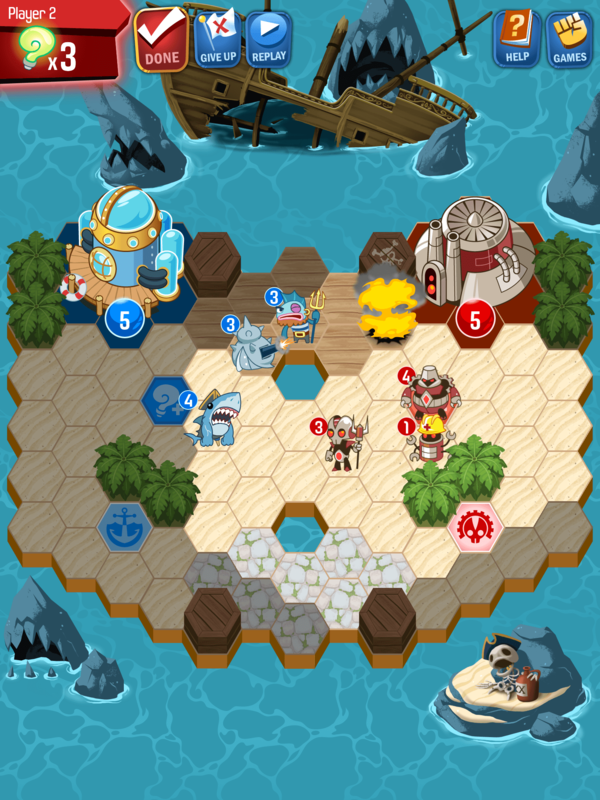 In a setup similar to that of Hero Academy, additional teams are available as in-app purchases. All the teams are fairly balanced so people who just want to play the base game for free can do so without penalty. The two IAP teams will cost 99¢ each (at launch) to unlock and consist of “a robot army called the Feedback (my personal favorites) whose special enslaves enemy units, and a collection of ridiculously cute creatures called the Adorables whose “Mobi” whale unit teleports allies across the map”. At 11pm (EST) make sure you cap off your 4th of July celebration by grabbing a copy of this freebie, you will not be disappointed!